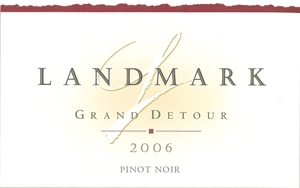 Landmark is better known for its excellent Chardonnays, but they have been making a fine Grand Detour Pinot Noir for several years that is sourced from several Sonoma Coast vineyards including Kanzler, Keller Estate, Gap’s Crown, Flocchini and Armagh. They also source Pinot Noir from several other California vineyards including Bien Nacido and Sangiacomo. Eric Stern was the tenured winemaker since 1993 who was assisted early on by Helen Turley. He retired in 2011 leaving the reigns to Greg Stach. Founded in 1974 by Bill Mabry and his family in Windsor, one of the original investors, Damaris Deere Ethridge, took control in 1989 and relocated the firm to Sonoma Valley at its present location at the base of Sugar Mountain in Sonoma Valley. Ethridge's son, Michael Deere Calhoun and his wife, Mary, joined the company in 1992 as her partners, and the couple became the face of the winery. In 2011, Fiji Water parent company Roll Global purchased Landmark Vineyards. The deal included the winery, inventory and an 11-acre vineyard. The history of the winery recounted above is in general acceptance but at the time of the sale of the winery, some disagreement arose over the proper founders. According to Mike and Mary Calhoun, the winery was founded by Damaris Deere Ford, Mike's mother, in 1974. 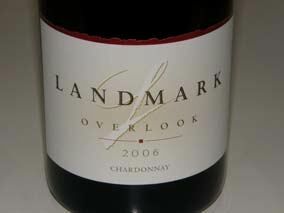 However, Bill Mabry, who worked as Landmark's winemaker until 1993 when he sold his interest in the winery to the Calhoun family, believes his family should be given credit for founding the winery. Media accounts in the 1970s and 1980s assign ownership to Marby. According to Marby, his family purchased the original property using money from a group of investors, including Damaris Deere Ford and her two sisters. The original winery in Windsor now houses the Hembree House Cultural Center, which showcases a display of Landmark's founding by the Marby family. Mike and Mary Calhoun think that they should be considered "founders" since the winery underperformed until they took over management and brought in new winemakers in 1993. Landmark Vineayrds was purchased by Stewart and Lynda Resnick whose $2 billion Roll Global company owns Fiji Water, POM Wonderful Juice, and farms 188 square miles in California for an undisclosed price. A tasting room is located at the corner of Highway 12 and Adobe Canyon Road in Kenwood. The winery also has guest accommodations. The wines are sold on the website and widely distributed. 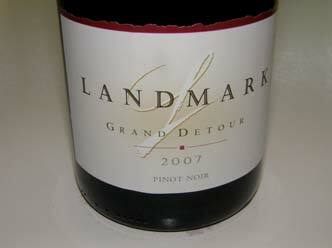 Annual production is about 25,000 cases including Pinot Noir, Grenache, Syrah and Chardonnay.